The Bentley Bentayga weighs more than two tonnes but its makers believe that underneath all that luxury is an SUV with a lot of performance to offer. 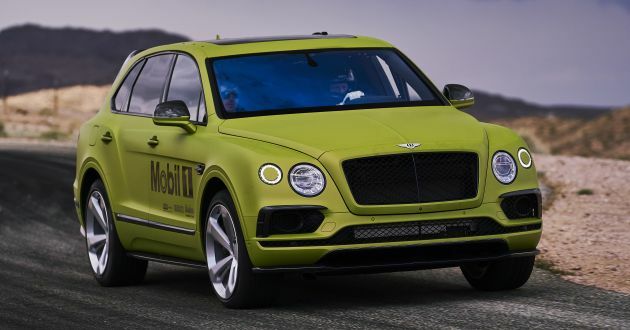 To prove their point, Bentley spent six months preparing and developing a race-ready Bentayga to take on this year’s Pikes Peak International Hill Climb. That’s right, the big SUV will be charging its way up the nearly 20-km course, which features 156 corners and a 4,720 feet climb. It isn’t just about making it to the top either, as the carmaker is targeting the production SUV record set by a Range Rover Sport in 2014. In accordance with competition rules, a few changes have been permitted like a roll cage, fire suppression system, racing seat and new Pirelli tyres. The SUV also gets 300 kg of interior trim stripped away because there’s no one to chauffeur during the attempt, as well as an Akrapovic exhaust system to make the ‘N’ part of NVH worse. To make sure everyone knows that a Bentayga is attempting the feat, the car in question is finished in a Radium Satin paintwork and Bentley’s Styling Specification kit – adding a carbon fibre front splitter, diffuser, side skirts and rear spoiler. “Our preparation for the event has been extremely thorough, and our Bentley Motorsport race engineers have produced a car that demonstrates the Bentayga’s inherent potential to the full. It’s now up to Rhys to drive the best run possible – but after his performances in testing, we have every confidence in him. The weather is the one factor we can’t control so we’re hoping for a clear Sunday morning,” said Brian Gush, director of motorsport at Bentley. “We’ve honed the Bentayga’s incredible abilities and ensured we have a car for Pikes Peak that’s both safe and fast through two very productive test sessions with the Bentley Motorsport team. The course is one you can only attack with a car that can gain and lose speed very quickly, because it’s so tight and twisty,” said Rhys Millen. “The combination of 600 hp, 664 lb ft (900 Nm) and carbon ceramic brakes means that the Bentayga can accelerate and decelerate incredibly hard – and that’s what I’ll be counting on for my run. I can’t wait to get started at the mountain later this week,” he added. “300kg of weight stripped away”. That is really not a Bentayga anymore. Any claim otherwise is misleading marketing. Might as well just take any custom pickup and drop in the Bentayga’s engine.